As any writer would, I thought to myself, I’ve never read that story. But my way in to how to tell it didn’t arrive until I got to know the town better. My discovery: Everybody’s on drugs in Indiana! My contractor turned out to be a crackhead; his wife, addicted to painkillers; their daughter, a heroin addict (she fought it; whenever I saw her over the course of several years she’d say, “Congratulate me, I’ve been clean two weeks!” (Haven’t seen her for a long time, though.)) The town I live in, once an industrial powerhouse, now boasts a methadone clinic, epidemic levels of HIV and Hepatitis C, high crime, high unemployment, and coming soon—and we’re all very excited about this—a needle-exchange program. More houses are demolished than built, and this is touted as progress. Meanwhile a large portion of the population in the local service economy gets by by selling a little weed or ice to one another. Despite living for years in Manhattan and Los Angeles, I never saw anyone shoot up until I moved to small-town Indiana and happened to look out my window. Same with smoking meth or crack, sniffing whatever or popping handfuls of pills: It's all on view. Everybody’s on drugs in Indiana! 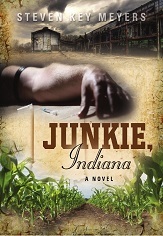 I made up very little in Junkie, Indiana; it's very nearly more transcript than novel. Most everything happened, even to the pregnant woman wandering the streets pretending not to know where she is. And why is Indiana today so appalling? Same big answer, I think, as regards most problems everywhere at any time: Lack of education. Not one of the people I’ve mentioned finished high school. Education in our society has lost its status—people don't want it! Indiana used to be different. Before it became one of those states that sets out every year to see just how much more it can carve out of its higher-education budget, Indiana built the great Indiana University. But that was when people saw education as an investment; now they see it as an expense, and if they have to have it, want it on the cheap. (But why would good education ever be cheap?) My town's high school—known to locals as a "droupout academy"—hangs from its cupola a banner that says “A”—“A” for the grade the state gives it; by contrast, Zillow.com, using data gleaned from the Gates Foundation, awards it three stars out of ten. And people wonder why families don’t want to move here? And why real estate values sink from year to year? Despite the state's having capped annual real estate taxes at 1% of assessed value? I suggest we legalize them! Second, drug revenue could be taxed and money raised for drug treatment (and maybe for education?). Third, quality control could be instituted. If drugs were regulated instead of banned, heroin, for instance, would no longer be contaminated by fentanyl, the ingredient blamed for many overdose deaths. The fourth thing that would happen is the bad thing: If drugs were legal, people would use drugs. Then again, they do that anyway. And possibly we should be a little quicker in writing off addicts? Instead of entering quicksands of fairy-tale logic and wishful thinking that permit them to enroll the rest of us as bit players in the exceedingly boring drama of their lives? "Congratulate me, I’ve been clean two weeks." Fortunately, what novelists do is not solve society’s problems but tell stories about the world. I’m satisfied that with Junkie, Indiana I’ve told that sad, very sad story I first heard from my contractor about his cousin. If it’s also a nihilistic story of despair, sorry, not my fault; it's true to the reality of the ever darkening state of affairs in Indiana, the Midwest, the USA.